For the 24 hours to 23:00 GMT, the USD declined 0.42% against the CHF and closed at 0.9660. In the macro news, Switzerland’s producer and import price index rose 3.4% on an annual basis in August, at par with market expectations. The index had recorded a gain of 3.6% in the previous month. 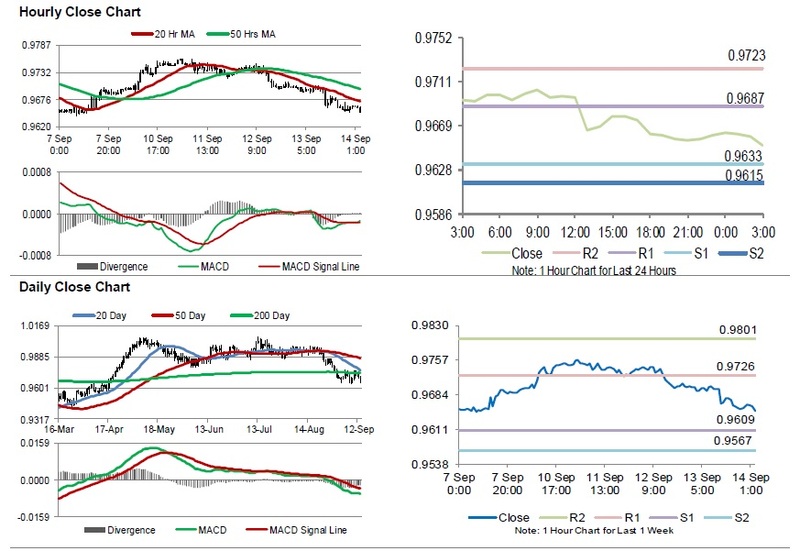 In the Asian session, at GMT0300, the pair is trading at 0.9651, with the USD trading 0.09% lower against the CHF from yesterday’s close. The pair is expected to find support at 0.9633, and a fall through could take it to the next support level of 0.9615. The pair is expected to find its first resistance at 0.9687, and a rise through could take it to the next resistance level of 0.9723. Moving forward, investors would keep an eye on the Swiss National Bank (SNB) interest rate decision and trade balance data, slated to release next week.